May 29, 2008 —Showcasing the newest additions in JBL’s VERTEC® line array series, local rental company Meeting Services, Inc. provided sound reinforcement for the La Fiesta Del Pueblo Cinco de Mayo music festival at the Del Mar Fairgrounds’ outdoor grandstand in San Diego with a powered, full-size system. Featured entertainers for the multi-act festival included popular Latin artists La Arrolladora Banda El Limon, Vilma Diaz y La Sonora, and Los Moonlights, among many others. Meeting Services deployed JBL’s new VERTEC DP Series powered full-size models for La Fiesta Del Pueblo, which drew a crowd of more than 10,000 people and was broadcast by Univision, the leading Spanish-language television company in the United States and Puerto Rico. The system included four stage-stacked arrays. Onstage arrays each featured five VT4889ADP-AN Full Range High Directivity Line Array Elements. Additionally, six VT4880ADP-AN Ultra Long Excursion Arrayable Subwoofers were positioned in a center array in front of the stage. Networking capabilities of the VERTEC DP Series systems with DPAN input modules allowed for CAT-5 cabling to harness the system, enabling the sound technicians to address each enclosure individually with Harman Pro’s HiQnet™ System Architect™ software for remote control and monitoring. The JBL VERTEC VT4889ADP Full Range High Directivity Line Array Element and the companion VT4880ADP Ultra Long Excursion Arrayable Subwoofer are integrated audio systems featuring field-proven JBL DrivePack® technology. Co-developed with Harman Pro Group sister companies Crown International and dbx Professional, the high-performance JBL DrivePack electronics modules with integral digital signal processing couple seamlessly with VERTEC loudspeakers. Headquartered in Northridge, California, JBL Professional is the world’s leading designer, manufacturer, and marketer of professional loudspeakers for recording and broadcast, musician, cinema, touring sound, commercial sound and contracting applications. JBL Professional is part of the Harman International network of professional and consumer audio companies. For complete product and company information, go to the JBL Professional website at www.jblpro.com. Headquartered in Northridge, California, the Harman Pro Group is part of Harman International Industries, Incorporated (www.harman.com), a leading manufacturer of high-quality, high fidelity audio products and infotainment systems for the automotive, home and professional markets. The Company's stock is traded on the New York Stock Exchange under the symbol: HAR. Harman Pro Group companies include AKG Acoustics, BSS Audio, dbx, Crown International, JBL Professional, Lexicon, Soundcraft, and Studer. — Hitachi Software Engineering America, Ltd. today announced the release of its StarBoard Viewer software for interactive whiteboards and panels. Hitachi StarBoard Viewer is a free download that not only allows users to open any file formatted with Hitachi’s industry-leading StarBoard software, but also to make edits and save work—even while disconnected from Hitachi StarBoard presentation products. StarBoard Viewer is the only software of its kind that allows users to save their changes for later use on interactive whiteboards panels and tablets. The Hitachi StarBoard Viewer allows users to view, modify and save StarBoard Software files on any computer and present the material using any brand of interactive whiteboard. The software is an open license application with features similar to Hitachi’s StarBoard 3.0 Light Edition software. It offers core interactive whiteboard tools including virtual whiteboard space, digital inks, the ability to manipulate objects, and the StarBoard toolbar. StarBoard Viewer differs from competitive viewers in its ability to save changes to files, enabling it to help build and deliver lessons outside of regular class time. Hitachi StarBoard Viewer allows new flexibility for teachers using tablets and interactive whiteboards in their classrooms. They can use the viewer to perfect their plans and presentations outside of the classroom, enabling smoother transitions between lessons when class is in session. For educators who switch schools or boards regularly, the viewer allows teachers to continue to use StarBoard files as they go from class to class. Students will also benefit from availability of the free StarBoard Viewer download. Because all work done on Hitachi interactive whiteboards and tablets can easily be saved and shared, the StarBoard Viewer software ensures that students can open and review lessons as they were first experienced in class. Children out sick can have classroom board work sent to them and opened with the viewer, ensuring that they keep up with their classmates. Because work can be edited and saved using the viewer, students can also create presentations at home for use in class, increasing time for classroom presentation. A pair of Soundcraft Vi6 digital mixing consoles – one at front-of-house and one at the monitor position – are at the front end of an installed sound system featuring a variety of Harman Pro brands at the new NOKIA Theatre L.A. LIVE, which recently opened in downtown Los Angeles. A centerpiece of the L.A. LIVE entertainment, residential and retail complex, located adjacent to STAPLES Center, is the 7,100-seat venue which will be joined later this year by the 2,300 capacity Club NOKIA, which will also feature a pair of Soundcraft Vi6 consoles and various other Harman Pro products. Robert Patrick, founder, president and principle project manager of IPR Services, oversaw the design-build of the audio and other systems at the entertainment venues at L.A. LIVE, which is being heralded as “Times Square West.” “What we tried to achieve was commonality of equipment between the monitor and front-of-house consoles and, because there are so many acts or tours coming through there will be a lot of one- or two-night stands, so the idea was to provide a console that touring engineers can familiarize themselves with very quickly,” says Patrick, who managed a team that also included acoustician Chips Davis, sound specialist Larry Spurgeon and video/IT technologist Dennis Kornegay. In addition to long-established touring industry recognition of the Soundcraft brand name and sound quality, the Vistonics™ II control surface was also a significant factor in the rider-friendly decision to install the Vi6 desks, according to Patrick, who has over 25 years of experience in designing, engineering and managing sound, video and communications projects. “By far the biggest criteria here were the ease of use and the unquestioned sound quality. The Vi6 fulfilled that admirably in that it is by far the quickest console to learn if you’ve never seen it before. Vistonics was the key to the console’s ease of use and gaining familiarity with it,” he explains. In addition to a pair of Soundcraft Vi6 consoles, the main PA system includes JBL VERTEC® line arrays, powered by nearly 400,000 watts of Crown I-Tech and CTs amplifiers. The entire system is configured and controlled via the Harman Pro Group HiQnet™ protocol. Once it is completed, the four million-sq.-ft., $2.5 billion L.A. LIVE complex, controlled by AEG (Anschutz Entertainment Group), will also include a 54-story, 1,000-room convention "headquarters" hotel (combining JW Marriott and Ritz-Carlton brands and 224 luxury condominiums), a 14-screen Regal Cineplex, broadcast facilities for ESPN plus entertainment, restaurant and office space, in addition to the two NOKIA venues. Headquartered at the Harman International Industries complex in Potters Bar, England, Soundcraft has built its global reputation over 35 years as a preeminent manufacturer of professional mixing consoles serving live, broadcast, theatre, recording and DJ markets. Worldwide sales and marketing for the brand is handled by the Soundcraft Studer Group, also of Potters Bar. In the United States, Soundcraft and Studer’s products are distributed by Harman Pro North America, a subsidiary of Harman International Industries. The Harman Pro Group (www.harmanpro.com) is the world’s largest provider of professional audio products and system solutions for commercial sound, contracting, tour sound, recording and broadcast, musician, portable PA and cinema applications. The Group is headquartered in Northridge, California and includes industry leaders AKG Acoustics, BSS Audio, Crown International, dbx, DigiTech, JBL Professional, Lexicon, Soundcraft, and Studer. The Group is part of Harman International Industries, Incorporated (NYSE: HAR), a leading supplier of high-quality, high fidelity audio products and infotainment systems for the automotive, home and professional markets. Demonstrating the rider-friendly characteristics of JBL Professional VERTEC® line arrays, IPR Services recently sold and installed the new permanent sound reinforcement system at the Nokia Theatre L.A. Live in Los Angeles. The 7,100-seat performance venue features a massive VERTEC line array system, based around VT4889 large-format line array elements. 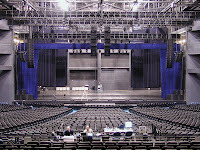 With the goal of providing an audio system that would fully meet the demands of such accomplished artists as Rush who have a keen focus on sound quality, IPR Services installed a left/right line array configuration featuring 12 VT4889 large-format line array elements per side, four VT4889 line array elements per side for out fill, and two center arrays of three VT4889 line array elements each for down fill. Two flown center arrays of 11 VT4880A arrayable subwoofers (22 total) combine with left/right onstage stacks of eight VT4880A arrayable subwoofer per side to form an overall LCR subwoofer configuration with individual subwoofer arrays configured in forward/reverse firing cardioid mode. Coverage is complemented by two VT4889 line array elements integrated with the left/right subwoofer ground stacks and stage lip front fills consisting of six VT4887A compact line array loudspeakers. Crown amplifiers power the system, which also includes two Soundcraft Vi6 digital consoles. For more information on IPR Services, please visit www.iprservices.com or call 626-893-4042. Eventide’s Eclipse™, single rack space effects processor, is providing renowned Front-of-House engineer, Titus, with a wide range of classic Eventide effects in the smallest possible footprint. Currently on tour in Europe, the band, We Are Scientists, relies on Titus to form the contour of sounds for its eclectic shows. Titus turns to the Eclipse for that power. Among the powerful capabilities in the Eclipse toolbox that Titus depends on is the dual-engine architecture, which allows two stereo effects to run at the same time, either in parallel or serial. Titus finds that the ability to use the two engines separately, or to sum the analog and digital inputs together, offers the requisite flexibility of operation needed for his application. Eclipse offers 90 of Eventide’s best effects chosen from over 37 years of boundary-smashing effects, widely heard on hit records spanning a multitude of genres. Eclipse has 390 great presets ranging from the Eventide signature micropitch shift to shimmer effects to multi-voice diatonic pitch shifting, delays, choruses, phasing and flanging. The Eclipse offers a wide variety of interfacing options from ADAT, AES, or S/PDIF digital inputs and outputs, to balanced XLRs, or hi impedance ¼” inputs for interfacing with instruments or in the insert loop of an amplifier. The April 11th concert at Velez Sarsfield Stadium drew a sell-out crowd of 40,000 people. To meet Stewart’s concert rider specifications, B.A.L.S. used a total of 52 VERTEC line array enclosures. The main left/right arrays featured 14 VT4889-1 full-size line array elements per side, with 12 VT4889-1 elements per side for out fill arrays. For additional low-frequency output, B.A.L.S. used both stacked and flown subwoofers—a total of 32 enclosures—to complement the full-range VERTEC system. JBL’s new VERTEC V4 DSP presets were used. JBL's new VT4889-1 full-size line array loudspeaker offers all of the performance and high-output advantages of the original VT4889, in a more affordable enclosure constructed from JBL's exclusive PlyMax® engineered-wood material. It is acoustically and mechanically compatible with JBL’s VT4889 full-size line array loudspeaker. "The system provided very clear sound, with a good, punchy presence," noted Federico Sainz, Chief Engineer for B.A.L.S. "Both of Rod Stewart's engineers, the FOH mixer and the system engineer, were very satisfied. I think the VERTEC rig gave us a great performance. We had good intelligibility all the way to the very last rows of the stadium seating [more than 100 meters from the stage]. We did have signal-delayed arrays set up in the rear as requested by the touring production, but those ended up being used at only 50 percent of the anticipated level." 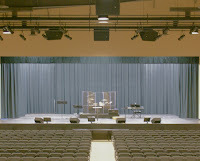 In a display of the versatility and pattern control capability of JBL Professional’s loudspeaker lineup, Yake Engineered Systems of Cambridge, Ontario, Canada recently chose to install JBL’s PD (Precision Directivity) Series loudspeakers into a new sound system at the Lakeside Church in Guelph. The project was part of an overall expansion to accommodate a congregation of approximately 1,200 people--three times its original size. Lakeside Church’s new setup includes four separate worship areas, all receiving the same message from the new main sanctuary. Besides the main sanctuary, the church features a youth worship space, a smaller traditional worship space for adults, as well as a café/lounge environment. The service is delivered through JBL products in each of the spaces. One of the primary challenges faced in the design of the main sanctuary was high reflectivity from the walls, requiring loudspeakers with excellent pattern control to minimize splash onto the side walls. PD Precision Directivity Series’ large 24” x 24” rotatable horns made them a natural choice for this project. The main sanctuary system features main and delay split clusters, each containing three JBL PD5212/64 loudspeakers. Two JBL SRX728S subwoofers provide low-frequency output, while eight JBL JRX112M loudspeakers serve as stage monitors. Additionally, Crown CTs and XTi amplifiers power the system, which also features BSS Soundweb, dbx DriveRack processing and AKG microphones. For more information on JBL Professional please visit www.jblpro.com. Looking for a projector that could provide high brightness and light weight in a compact chassis, Innovative Markets turned to the Hitachi CPX5 for use with Skyview, a brand-new media format that provides full-motion HD video and static, billboard-like advertising space at conventions, concerts, malls, sporting events and promotional advertising campaigns. At the recent New York Times Travel Show in New York, Innovative Markets used Skyview promotional spheres to promote South Africa Tourism and the 2010 World Cup. To bring this unique form of advertising to life, Innovative Markets turned to the Hitachi CPX5. Demonstrating the ease of use and reliable performance of Hitachi LCD projectors, Provision Media has installed more than 150 projectors throughout the Shakopee School District in Minnesota. The projectors are installed in classrooms in all schools across the district, as well as in common areas and large auditoriums. Shakopee School District serves 5,800 students in Shakopee, Savage, Prior Lake and Jackson, Louisville and Sand Creek townships. On the outskirts of Minneapolis, this district has experienced rapid growth in recent years. The IT staff at Shakopee, led by Mr. Wade Phillips, is committed to selecting and deploying the latest and most cost-effective classroom technology. Provision Media installed a total of 65 Hitachi CP-X260 projectors in classrooms in the new Shakopee High School and another 45 CP-X260 projectors in classrooms at the new Eagle Creek Elementary School. A Hitachi CP-X1250 projector was also installed in the cafeteria commons at the High School, which projects video off a column to a wall so everyone in the cafeteria can view the extremely large image. Additionally, Provision Media has begun installing the new Hitachi CP-X300 projector model in classrooms at other schools throughout the district. For more information on Provision Media, please visit www.provision-media.com or call 612- 216-3785. In a remarkable milestone that speaks to the performance and road-proven reliability of Crown Audio’s I-Tech family of live sound amplifiers, tour sound superpower, Sound Image of Escondido, California recently passed the 5,000,000 watt mark in I-Tech inventory. In recognition of this landmark achievement, David Shadoan, President of Sound Image, will be presented with a specially-crafted award on the opening day of InfoComm 2008. Sound Image has deployed Crown I-Tech amplifiers on some of the highest profile and most successful tours in the United States over the past few years. Gwen Stefani, Toby Keith, Rascal Flatts, Eric Clapton, Carlos Santana and Jimmy Buffett have all traveled with an arsenal of I-Tech 8000 amplifiers in tow. Demonstrating the continued international success of JBL VERTEC® line arrays, Corporacion Dynaco C.A. recently provided sound reinforcement for an outdoor concert in Venezuela featuring Marc Anthony. The show took place at the University of Caracas Baseball Stadium and drew an audience of approximately 15,000 people. One of the most popular salsa artists of all time, Marc Anthony has sold more than 10 million albums worldwide and has been awarded 12 Latin and Standard gold and platinum certifications by the RIAA. He also earned a GRAMMY in 1998 for Best Latin/Tropical Performance (“Contra La Corriente”) and has won three Latin GRAMMY Awards. BSS Varicurves were used for main system signal processing and system driver functions. Remote control and monitoring of the system, including adjustment of signal processing for the various speaker zones, was achieved with HiQnet System Architect Software, configured on a MacBook Pro running MS Windows. — Providing educators with an optimal combination of usability, quality and security, Hitachi Home Electronics (America), Inc., Business Group today introduced three new LCD projectors: the CP-X201, CP-X301 and CP-X401. All three models feature a new 2,000-hour filter and offer a lower total cost of ownership to schools in K-12 and higher education, thanks to high performance and a variety of technological advantages unique to Hitachi projectors. The CP-X201, CP-X301 and CP-X401 vary in brightness (CP-X201: 2,200 lumens; CP-X301: 2,600 lumens; CP-X401: 3,000 lumens), but all weigh a very light 7.7 pounds and are easy to install or use on a cart top. The three models feature 7 Watts of built-in audio, eliminating the need for external speakers, while the Audio Pass Through function allows audio to play while the projector is in standby mode. The projectors all maintain a low noise rating of 29 dB in Whisper Mode. The CP-X201, CP-X301 and CP-X401 all feature a new hybrid filter, which lasts for 2,000 hours before replacement, on the side of the chassis. Additionally, the lamp door is located on the top of the projector for easy replacement if the projector is ceiling-mounted. The CP-X201 and CP-X301 also offer longer lamp life (3,000 hours in standard mode; 4,000 hours in Whisper Mode). The three new projectors bring a new level of customizability to educators, offering Hitachi’s proprietary My Buttons functionality, allowing two buttons on the projector to be programmed to executive any projector command. The projectors also offer Input Source Naming, allowing users to rename input sources to fit their needs. An improved remote control now features a My Source/Doc Camera button, allowing users to directly choose an input source, or document camera. The new remote control also features volume buttons. The CP-X201, CP-X301 and CP-X401 feature Automatic Vertical Keystone, which detects the angle of the projector and corrects the image. The projectors also offer Whiteboard Mode, providing adequate clarity while limiting brightness for use with whiteboards. Day Time Mode allows users to clearly see the images in a bright environment, while Blackboard Mode offers better color balance when displaying an image on a colored background. The CP-X201, CP-X301 and CP-X401 also feature a Transition Detector, which requires a password to operate the projector when it is moved from a fixed position. The CP-X201, CP-X301 and CP-X401 also offer PIN Lock and MyScreen Lock functions, as well as a security bar that enables the use of a heavy chain to prevent theft. Reinforcing JBL Professional’s leadership position in the development of portable loudspeaker technology, the JBL VRX932LAP powered portable line array loudspeaker earned a MIPA Award in the Portable Sound category at Pro Light & Sound 2008. This is the fourth consecutive year that JBL has won the MIPA Award in this category. Designed for use in arrays of up to five units, the VRX932LAP is the ideal choice when line array performance is needed but the venue size does not call for the long-throw characteristics of large line array systems. The VRX932LAP is a 12-inch, two-way powered line array loudspeaker featuring a JBL DrivePack® DPC-2 amplification system that provides 1750 Watts of peak power. A DSP-based resident input module provides system optimization and equalization. Demonstrating the rider-friendly performance and ease of installation of JBL Professional VERTEC® line arrays, audio consultant Media Systems Design Group oversaw the design of the sound reinforcement system at the new Gallo Center for the Arts in Modesto, California. The Gallo Center is a $40 million complex that includes two performance spaces: the Mary Stuart Rogers Theatre (1,250 seats) and the Foster Family Theatre (444 seats). The Gallo Center for the Arts is a non-profit organization owned by Modesto County designed to enrich the quality of life in California’s Central Valley by providing an inspirational civic gathering place where regional, national and international cultural activities illuminate, educate and entertain. The Gallo Center celebrates the diversity of the Central Valley by offering an array of affordable cultural opportunities designed to appeal, and be accessible, to all. The audio system at the Mary Stuart Rogers Theatre includes a left-right configuration of nine VERTEC VT4888 midsize line array elements per side, along with two VT4882 midsize arrayable subwoofers per side. 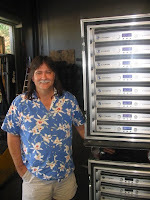 Crown I-Tech amplifiers power the system. The Foster Family Theatre features a left-right configuration of six JBL VRX932LA portable line arrays per side, with four stage-mounted VRX918S portable line array subwoofers. For more information on Media Systems Design Group, please visit www.msd-group.com or call 310-398-0281. For more information on PCD, Inc., please call 707-546-3633.